Chelsea's week that was: Hazard admits he is struggling at Chelsea! Think back to five or so months ago. Eden Hazard had won the Premier League, the League Cup and numerous individual awards and was at the highest point he had ever reached in his career. Now, he admits he is struggling at Chelsea. It's an alarming decline and one which we have all felt. At times such as these, you look to the players that you know can make a difference. Players that can turn a game in a moment and players that inspire everyone else to lift themselves. Eden Hazard last season was one of those key players. 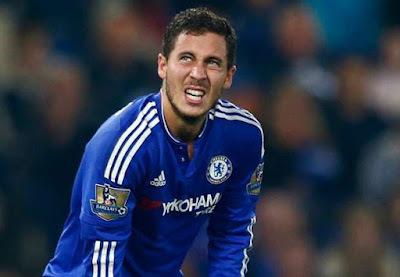 This season, Hazard as with many others, looks a player at his lowest ebb, down on confidence for whatever reason and as a result, looks a shadow of the player who was voted the best in the land by his fellow professionals. "This is the first time in my career that I have had such a difficult spell like this. I can’t really explain it. All I know is that I will need to work hard in order to bounce back. At Chelsea we have concerns both as a team and individually. We all thought that our recent win against Arsenal would give us lift-off – but instead we fell straight back into our bad ways. I was left on the bench against Porto in the Champions League, and I am no longer immune to being left out. You can be untouchable when you play well, and that has not been the case with me. I think the manager wanted to send me a message by making me a sub. I don’t read everything he says, but he explains everything. I am not too worried for him – Mourinho is the best coach in the world when it comes to dealing with pressure. I am an optimist, and I know I can learn a lot from tough spells. I hope to come back stronger, and I am ready to play and do my best. I see my two games for Belgium this week as a launchpad for my season with Chelsea. I think we all agree that this two-week break has come as such a crucial time for Chelsea. We looked in disarray, like a team that were short of ideas and confidence. As each day passes it should give the manager and the players time to refocus, to reflect on what has gone wrong and to commit to working harder than ever to put things right. Eden Hazard is one of the key players in our team and we need him back to his best as quickly as possible for us to start winning games again. However, it's my opinion that he has almost been given much more freedom this season to stray away from that left hand side and we keep seeing him pop up in the middle of pitch trying to make an impact from there. I want and Chelsea need Hazard to hug that left hand side, stick to it like glue and use that position as a platform to isolate the defender he is up against to cause problems that the opposition have to try and deal with just as he did last season.